Is BlueHost a good web host? Find complete BlueHost review here! - Special Discount: $5.45/month. Up to $343 off now! BlueHost basic plan can only host 1 website. 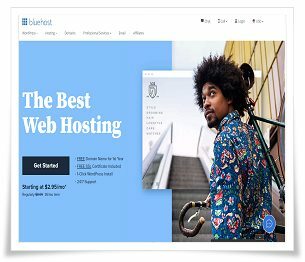 If you're not planning to host many websites and looking for cheap web hosting service, you can consider the cheap Bluehost's basic plan ($2.95/month). Both Bluehost plus and prime plans offers unlimited websites hosting, unlimited diskspace, bandwidth, emails, MySQL databases and etc. The differences between plus and prime are prime also include SiteBackup Pro and domain privacy. As Bluehost is offering a promotion now, the prime and plus plan is priced equally at $5.45/month. As such, we would strongly suggest that you choose prime plan when you decide to purchase. Hence, this Bluehost review will focus on Bluehost prime plan. Bluehost prime offers a very competitive and complete web hosting plan that could easily meet most of your web hosting requirements but at a fraction of a cost of US$5.45 per month. Bluehost prime plan offers unlimited disk space and bandwidth. Moreover, you can host multiple domains with a single BlueHost account. In other words, you can operate unlimited unique URL websites under just one BlueHost account at only US$5.45 per month. Recently, we just added a new website onto our BlueHost account with no extra cost except only the cost of domain name. We're planning to add more websites onto BlueHost to save more cost in the future. Free Domain - All Bluehost share hosting plans will get a free doamin name (.com, .net, .org, .biz, .info, .co) for first year. Free Site Builder - Bluehost offers few free site builder sofwares such as Soholaunch, Concrete5, Trendy Site Builder ...etc. With hundreds of free web template design, you can create your website easily and quickly without knowing any HTML knowledge. MOJO Marketplace - The MOJO Marketplace (formerly was Simple Scripts) is a collection of popular website plug-in scripts that can be installed into your website directly from the control panel. Example of the Fantastico scripts that you can add onto your website easily are Bloggers, Forum, PHP Nuke, Poll/Survey and many many more. mySQL Database - While many web hosting service providers support only 1 to 5 mySQL databases, BlueHost offers unlimited mySQL databases at your disposal. You will need many mySQL if you plan to create a web site that supports dynamic web pages, online forums or shopping cart software. BlueHost also supports unlimited PostgreSQL databases just in case you need them. 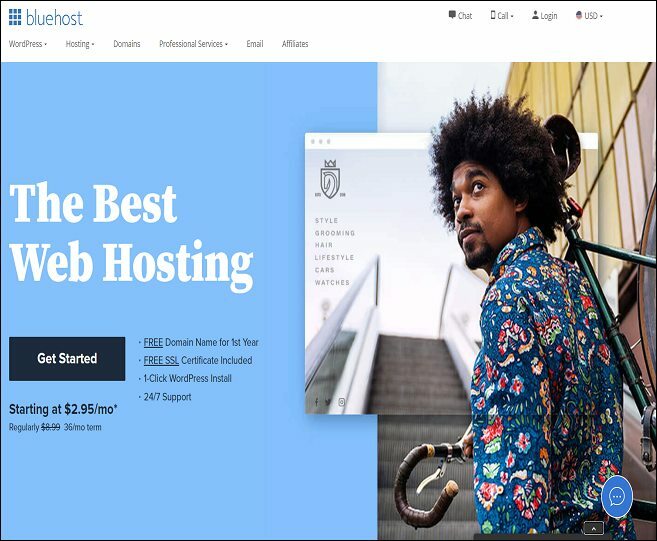 BlueHost is renowned for its outstanding customer service (Best Customer Service Winner, 2009 by Hosting Review) by providing various channels of support. You can reach BlueHost's sales personnel or technical specialists by toll-free telephone or emails 24/7 whenever you need it. BlueHost's records showed that 75% of the average hold time for customers on the phone were answered in less than 30 seconds and the average ticket response time for Level 1 queries was less than 50 minutes. That is considered exceptionally good in the web hosting industry standard.
" I have been a Bluehost customer for over 3 years, and have hosted over 15 websites with Bluehost. I have been very impressed with the knowledgeable support staff that I have spoken to. It is also refreshing to know that when I have a question I can quickly contact them anytime day or night and speak to someone that does not speak broken English located somewhere across the world. Huge plus! Compared to other web hosting server services that I have used, including a dedicated server service, Bluehost has hands down been the most reliable company I have worked with. In addition, the amount of services that they include with their affordable monthly service fee has been wonderful! I have referred several of my friends to Bluehost and will continue to refer more as a result of their competitive price, superior support staff and reliable service. " Bluehost's prime web hosting plan is loaded with many hosting features that could be better than many of the popular web hosting providers out there. With more than 2 millions websites hosted on Bluehost, it goes to show that many webmasters are confident with Bluehost web hosting service. The e-commerce ready hosting plan comes with unlimited disk space and bandwidth plus unlimited mySQL databases. 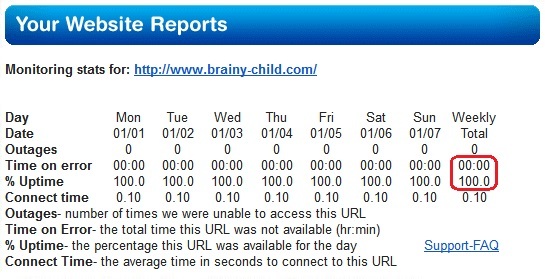 Moreover, you can host unlimited websites on a single BlueHost account. We think it is a steal for $5.45 per month.